The Marian Sanctuary in Monte Grisa is an immense building that looms above Trieste and its beautiful gulf. Called the "formaggino" (cheese triangle) by Trieste residents due to its triangular shape, the Marian Sanctuary can be reached on foot by walking from the obelisk in Opicina or taking the Napoleonic Way in Prosecco. 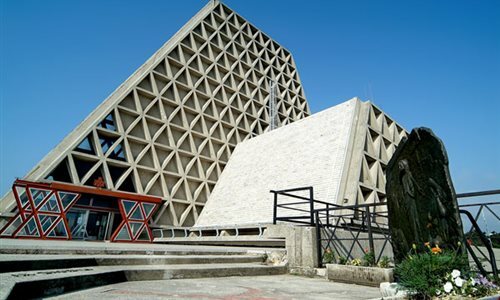 Dedicated to Mary, Mother and Queen, the Sanctuary of Monte Grisa was designed by architect Antonio Guacci based on sketches by Antonio Santin, the Archbishop of Trieste, as a votive offering to protect Trieste from bombs during World War II. Built between 1963 and 1965, it was inaugurated in 1966. Over the years it has been a destination for pilgrimages, including one made by Pope John Paul II, who visited the sanctuary on 1 May 1992.